This weekend we have family in town so we’re going to be spending a lot of time on the lake! I’m also hoping to get some of my dorm room details figured out and start to get some of my stuff for next school year organized! I’m starting to gather ideas for future posts during the school year so if you have any suggestions, comment on this post and let me know (or feel free to email me prepaavenue@gmail.com) ! P.S. Don't forget to enter into the awesome giveaway to win an adorable Evelyn Henson Print! I would love it if every once in a while you could include some beauty stuff into your blog. Thank you for all your lovely blog posts! 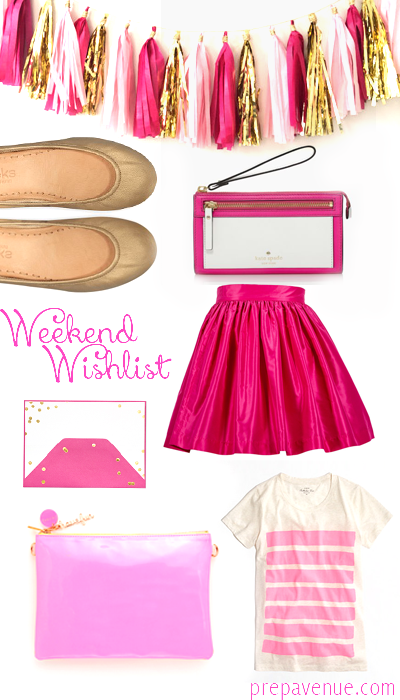 This pink skirt is absolutely adorable! I love everything!! But how could I not like anything pink? i have been eying that tassel garland for a while, I might have to buy some for my apartment when I get back to school because it is just too darn cute!